The story will continue on Oct. 27. Thanks and Scribal Points to all who participated. And Scribal Points to be awarded for each entry in the Round Robin. 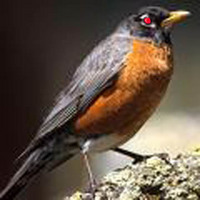 Round Robins are an ancient and profoundly dubious tradition at Scribal Terror. They are collaborative fictions, written on the fly in the comments section. ST Round Robins usually involve a character named Robin. They usually happen around Halloween. And they usually flirt with THE DARK SIDE. We missed Robin last year, but the old bird has not died. Not strictly speaking, anyway. He is back, and he doesn't drink . . . wine. When we have enough offerings to choose from, we'll take a vote. Then we will have at it. There will be no holds barred. We will plumb the depths. We will kill each other's characters. We will go where no collaborative fiction has gone before. And it will be immensely silly. Muahahahahaha! If you like origami and air superiority. . . This is the first of Jake's Toby series -- from ST 2005. I've been promising to rerun these so everyone knows about Toby [and, eventually, Tina]. You're not going to believe what I woke up to this morning. Last night I took my handful of pills and went to bed at 9 just as I always do. At 10 I still wasn't feeling sleepy at all so I decided I needed a little more help and I got up and fixed myself a nice fat meatloaf sandwich with swiss and extra mayo on sourdough and a 32 oz Miller Ice. On top of that I dropped a couple more Xanax and a Temazopam just for good measure and went and crawled back in bed. Well, I guess that did the trick because I don't remember falling asleep. Just a long, weird dream about walking by the Sound and seeing this really bright light in the sky that I took to be military plane or a meteor or something, getting closer, and closer, and..... then I woke up. What woke me up was alarm going off like a big red flashing warning light in my head.. wahhhh wahhhh wahhhh wahhhh. I rolled out of bed and holding my eyelids open with my fingertips, squirmed on my belly down the hallway toward the smoke detector to find out what was going on. When I got there, there was no fire.. There wasn't even any smoke and siren wasn't coming from the smoke detector, so cupping my hands behind my ears so I could hear directionally like a rabbit I started a systematic search of the house, and this is what I found. Slowly I spread open the remaining tinfoil, which wasn't actually tinfoil at all but rather a metallic foil with odd glyphs all over it that promptly laid itself out flat without a crease then folded itself in half 7 times and disappeared. Inside was this baby....boy... I'm calling him a boy though he doesn't appear to have either male or female "parts," but he looks like a boy so I'm calling him a boy. I've named him Toby after Toby Tyler the little boy that ran away to join the circus. God must have heard me wishing for another child (though in truth I was kinda looking forward to his coming complete with a mother and some fun in the baby making process.. but God works in mysterious ways.) 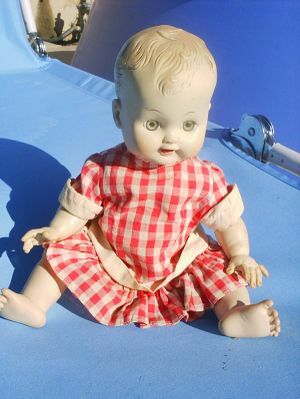 I'm going to raise him as my own and I've dressed him in an old doll dress my daughter left here years ago.. (its the best I have for the moment..its either that or a dishtowel toga). So anyway, I'll let you know more about how things are going with Toby soon. I've just noticed that he appears to be able to shoot deathrays out of his eyes (judging by my now smoking and very dead cat, Mr Tibbs.) and he's saying "Bah-Bah".. so I guess I better hop to it and get him something to eat. Update: We are invited to submit our entries at [email protected] Entries should include haiku, name, contact info (include city, state, country), and age if under 13. Limit of twenty entries per poet. Let's see what kinds of bug poetry we Scribalistas can come up with. Can we compete? Are we bug-savvy enough? Here goes . . .
We are SO insects ! And feed the teaming masses. Oh for an ant's strength! Go eat bugs in my garden! Weave not on my chair. Zoom by on a summer's day. Stick not in my foot. living in the garbage can. Yuck: half fly, half worm. As I've grown old and poor in America it occurs to me that so many of the pleasures I took for granted in my younger years for one reason or another aren't available to me anymore.. I've grown too old, or too poor or too ugly or too out of shape or too reclusive and one by one they've all fallen by the wayside. In response I've learned to appreciate and savor even the smallest moments of pleasure that I stumble upon as I go about my day. Today for example. Today is one of those damp, chill winter bastards that go right through your clothes like the icy hands of a stranger copping a feel in a packed subway car.. You cant even dress thick enough to keep it out. At least that's how it seemed as I stood bundled in my hoodie shivering in the morning mist waiting for my bus into hell. Finally after a twenty minute wait that could have passed for an hour my bus arrived. Shambling on board and into my regular seat more by instinct than conscious thought I spread out across two seats, pulled my hood down over my eyes and prepared to tune the world out for a few. As I sat there, though, I heard the bus' heater click on and suddenly a warm breeze that I could easily have mistaken for a Moroccan sirocco with a little imagination poured over my head and spread over my entire body driving off the damp chill and hugging me in an embrace more pleasant than any woman's. That moment seemed to pause in time and stretch out for quite a while.. It occurred to me as I sat there basking in the moment that I, probably like most people, have spent most of my life waiting for things to come together... to coalesce into some earthly nirvana with the perfect wife and the perfect family.. The perfect house and job.. the perfect life coming together like a giant jigsaw when I can just manage to gather all the right pieces and I'll finally be deserving of the BIG pleasures.. the luxuries due a person after years of dogged struggling.. But as I sat cocooned in the warm breath of the bus it came to me that maybe the day never comes when one can just quit struggling and enjoy the well earned fruits of one's labor.. Maybe these moments are what it's all about... A life's journey of moments... not a destination. We used to do this a lot in the early days of Scribal Terror -- readers submitted stories, reflections, poems, drawings, etc., and ST would publish them. I always liked that feature, and I hope Jake's contribution inspires more people to submit something of their own, as ST comes up on its third birthday. Maybe we can do some round robins too! Surely someone, somewhere, can rise to the challenge. As a freelance writer, I accumulate paper at a staggering rate and my filing system has finally broken down. So with the aid of my trusty scanner and my 6GB Gmail account, I am scanning digital copies of items and emailing them to myself along with Gmail labels so I can find them again. Geeky? Perhaps. But at least I will never lose a document ever again when I need it. . . . When I found spiders making a home behind one of the big stacks of magazines, I knew it was time to get rid of them. I went through each magazine and ripped out the pages I wanted to keep. The rest got thrown out in the trash (amazing how good THAT felt). The pages I wanted to keep were scanned and turned into PDF files, which were then emailed to myself with a “database” label and keywords in the email subject line. Now my magazine files are organised but I am probably a pariah in the spider community right now. I'm doing this TODAY. Thanks, Mark! Even though the tree trunk is hollow, it walls are up to two metres thick.